BeoVision 4 offers greater flexibility and modular convenience to Bang & Olufsen customers than has previously been possible. BeoVision 4 is available in different sizes and consists of the screen, BeoSystem 2 and a cabinet. BeoSystem 2 is the master unit having the same functionality as BeoVision 5. 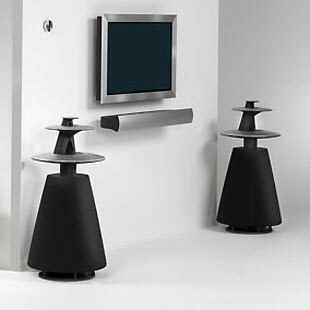 The recommended centre channel loudspeakers are BeoLab 4000. This plasma TV set has been previously only available in the North American market including Canada, Mexico and the US. 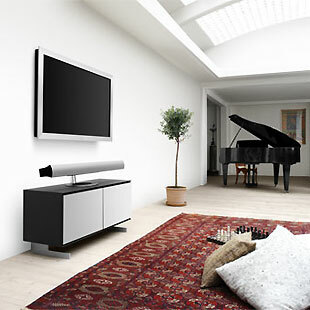 When combined with speakers and stands, BeoVision 4 becomes an integral part of BeoSystem 1. However, from Spring 2004 the system - known as Beosystem 2 - arrived in Europe. Cabinet 2168 is similar to cabinet type 2164 and has a shiny, aluminium-coloured front. Within it can be placed a satellite decoder, DVD 1 and/or Beocord V8000, if these are your required options. A new wall bracket and table stand for the BeoVision 4 range will be available from December 2004. The new wall bracket is finished in black lacquered steel and with its reduced dimensions is suitable for use with the 37”, 42” and 50” screen options. The table stands will be available in two options: one for BeoVision 4-37 and the other for either BeoVision 4-42 or BeoVision 4-50. The Table Stands will be finished in black, painted aluminium. The only accessory for BV4-65 is the wall bracket. Introduced on BV4-65 will be a slightly darker Contrast Screen resulting in an improved perceived picture quality due to the lower black level. an elegantly designed cabinet for placement of BeoSystem 2 and a separate box solution, e.g. DVD 1. In line with our vision of constantly questioning the ordinary in search of surprising and long-lasting experiences, it is crucial for Bang & Olufsen to stand out. The mere offering of a plasma solution with a separate master unit is far from unique in the market today. Still, we put great value in differentiating Bang & Olufsen products from our competitors. A true Bang & Olufsen visual expression and craftsmanship to the last detail with the aluminium frame on the monitor, the design of the cabinet and the possible combination with BeoLab loudspeakers, BeoVision 4 – 42 has a true Bang & Olufsen visual expression. This is characterised by an elegant design, an exquisite choice of materials and craftsmanship to the last detail. The aluminium frame is mounted on a handmade mainframe made of steel. There are no visible screws or welding notches – even the screws are handmade in order to ensure a smooth surface and not disturb the visual expression. By means of our special surface treatment competences, we have achieved a beautiful yet robust surface of the aluminium on the frame and the cabinet. BeoVision 4 – 42: a system master that offers freedom of application. The BeoVision 4 – 42 solution offers not only sublime experiences in a home-cinema setup. It also is fully compatible with the Beolink® system and can work as a system master that distributes sound and/or picture to up to 16 rooms. BeoVision 4 – 42 is a modular system, it has a built-in Dolby® Digital/DTS® module, and it can be integrated with the entire BeoLab loudspeaker range, as well as with Bang & Olufsen audio and video products. There is only one cable between the monitor and the master unit which increases the placement flexibility. All this maximises the freedom of application - only your imagination sets the limits for a true Bang & Olufsen experience. Despite the possibility of integrating BeoVision 4 – 42 with many products and features, the operation is well-known and simple – based on one remote: Beo4. This is ensured via the IR-eye which is connected to BeoSystem 2. The built-in Set-top Box Controller is an example of the simplified operation principle of Bang & Olufsen; digital television can be received from a separate satellite box, but still operated with Beo4. VisionClear is a concept developed by Bang & Olufsen that focuses on picture improvement technologies. Among the technologies is the peaking technology, which sharpens the picture by making a simulated contour around objects so that every detail stands out. There is a tendency in the market to overdo the peaking – so that the picture becomes unnaturally sharp. Bang & Olufsen focuses on creating a natural sharpness in the picture – therefore the picture is only peaked to a certain limit. The natural picture is moreover helped by noise reduction. 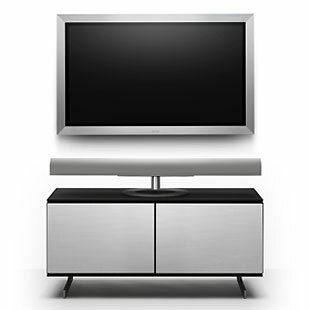 As the peaking technology also makes noise more visible, a noise reduction circuit is incorporated in BeoVision 4 – 42 to compensate for the increased noise. This way BeoVision 4 - 42 offers sharp yet noiseless pictures. The Viewing Comfort concept focuses on the interface between the screen and the user, and between the screen and the room. It has been developed to improve the subjective viewing experience of the user. Viewing Comfort elements in BeoVision 4 – 42 include the anti-reflection coated contrast screen, which reduces reflections of incoming light and improves the black level. 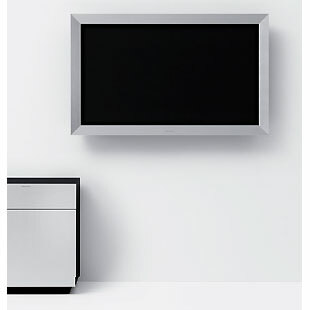 The black level of BeoVision 4 – 42 is better than what is generally seen in the market for plasma – meaning that what looks black is more black, rather than grey. The result is deeper and richer colours. Other Viewing Comfort elements in BeoVision 4 – 42 are electronic curtains and automatic picture format optimisation. (Due to the separation of monitor and master in BeoVision 4 – 42, the Automatic Picture Control feature known from BeoVision 5 and other BeoVision products is not available in BeoVision 4 – 42). Sehr geehrter Fachhandelspartner, wir freuen uns Ihnen mitzuteilen, dass wir in Kürze ein weiteres Produkt Highlight einführen werden: den BeoVision 4-42 von Bang & Olufsen! und sorgen für unübertroffene Bildqualität. Das Kabinett selbst ähnelt dem bekannten Video-Möbel vom Typ 2164 und glänzt ebenfalls mit einer silberfarbenen Aluminiumfront. Das Schubladensystem bietet Platz für das Beosystem 2 und weiteren Stauraum für eine optional anzuschließende Videoquelle wie DVD1, V 8000 oder einen externen Dekoder. Die unverbindliche Preisempfehlung in Deutschland und Österreich bzw. der Verkaufspreis in der Schweiz des BeoVision 4-42 (inkl. Beosystem 2 und Kabinett) wird bei ca. Produkteinführung findet im ersten Quartal 2004 (Kalenderjahr) statt. Freuen Sie sich mit uns auf den neuen BeoVision 4 -42 von Bang & Olufsen! Plasma-Heimkino-Lösung von Bang & Olufsen. DVD1, V 8000 oder einen externen Dekoder.